Secnidazole is a nitroimidazole drug, an orally active antiamebic, antiprotozoal drug used for the treatment of infection. Fluconazole is a triazole group drug, an orally active used in the treatment and prevention of superficial and systemic fungal infections. Azithromycin is the first clinically developed antibiotic in a new subclass of the macrolides, is one of the world's best-selling antibiotics, and is derived from erythromycin. 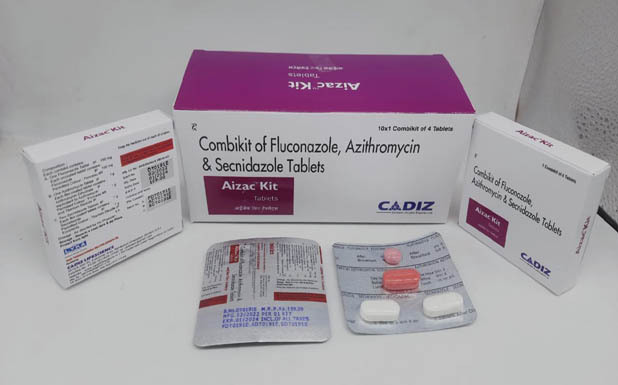 The combination kit with azithromycin, secnidazole and fluconazole is more effective with better symptomatic relief and less recurrence rate and may be routinely recommended in all cases of lower genital infection and syndromic management of pelvic inflammatory disease in a cost effective, safe and effective strategy. IMMEDIATELY INFORM YOUR PHYSICIAN OF THE SIDE EFFECTS, IF ANY. Fluconazole needs to be advocated with due precaution along with oral hypoglycemics, coumarins, phenytoin, cyclosporine, rifampicin, theophylline, astemizole, rifabutin, tacrolimus and short-acting benzodiazepines. As azithromycin interacts with aluminium and magnesium-containing antacids, digoxin, ergot derivatives, triazolam and drugs metabolized by cytochrome P450 such as carbamazepine, cyclosporine, phenytoin, it must be co-administered with care. Secnidazole also has potential to interact with coumarins and hence the medication must be co-administered with care along with such anticoagulants. ●	Kit contains three chemotherapeutic agents Azithromycin, Secnidazole and Fluconazole. These 3 drugs do not cause drug interaction when given together on the same day concomitantly. ●	The dug should not be administered during the first trimester of pregnancy or lactation. ●	The medication is to be advocated with due precaution in hepatic and renal disease, and potentially proarrhythmic conditions in view potential of fluconazole and azithromycin to induce liver and kidney dysfunction, and cardiac conduction abnormalities. ●	It should be advocated with care in diarrhea since azithromycin usage could be associated with pseudo membranous colitis. Keep medicine out of reach of children.